I love this picture of Bear- he looks like a punch drunk puppy- doesn't he? He has a piece of chewbone in his mouth-and Annie's hockey helmet on. Poor guy- he doesn't know how entertained I am by this picture. Speaking of pictures- check this out- this is in one of Lavold's books, and I just fell in love with it. And, elann.com had the Lavold angora on for half price, and in the bright red, and soooooooooo..... well, you can guess what happened. This sweater is for the next Christmas season, so I figure I have lots of time to make it. I think I might modify the sleeve- I don't usually do well with a dropped shoulder. We'll see. And I could wear it over black? Or dark gray? Or..? I think it will look quite smart. That's is a terrific looking sweater (and yet another one to add to my growing list of "wanna knits"). Bear is too funny in that pic. 1. Thanks for the heads up about the Knitters Treat Exchange. I have thought about doing one of the exchanges before but most of them are a bit difficult for me to manage $$wise at the moment. KTE is within range so I joined up and am looking forward to it. 2. 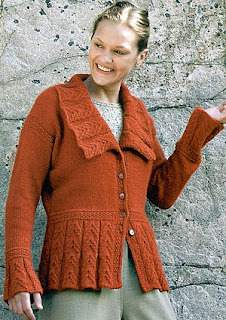 The cardigan is gorgeous - and I don't mind the dropped sleeves but I'd have to change the cuffs if I was knitting it as I'm a grub and the sleeves would end up messy all the time. 3. I hope Annie had a great time on her Brownie Sleepover. I can relate to the tiredness - I'm a Guide leader and us leaders get wiped out on these things too. After a Guide Jamboree (8-10 days in tents) I sleep for 24 hours straight.